Ken Hall has experience with prosthetics thanks to his work as alien Jeff the Grey on TBS’s People of Earth. 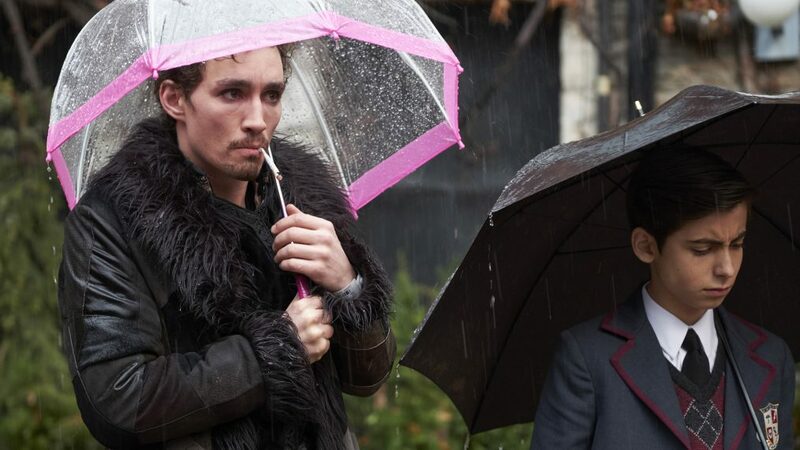 And on the upcoming Netflix series The Umbrella Academy, the Canadian actor got a challenge of a different kind providing motion-capture work for the genetically and intellectually advanced chimpanzee Pogo, voiced by Adam Godley. The show is an adaptation of the graphic novels and stars Ellen Page, Tom Hooper, Cameron Britton and Mary J. Blige. The story surrounds six survivors adopted by the wealthy Sir Reginald Hargreeves after being born in October 1989 by different mothers on the same day, despite her not having been pregnant the day before. These unlikely would-be superheroes are estranged until Hargreeves’ death forced to face a global apocalypse on the horizon. The 'Misfits' actor talks massages, bakeries and why he likes playing such chaotic characters. Hall, who recalls early comic fandom growing up, likens Pogo to an uncle who serves in a sort of caregiver and emotional support role. He spent six months on the Toronto set embodying the unique primate. “I’ve played a lot of elves in my day,” Hall, who proudly stands 4-feet-9-inches tall, said. Helping the process was the ability to work directly with the actors and delivering lines. Hall worked with his acting coach and watched YouTube videos to get a sense of chimpanzees in their element. It was important for him to match the physicality with the text in the script. As the season progressed, Hall discovered more nuances and evolved with the character. About 30 yards away at another set, Hall shot scenes at the same time for another Netflix project in the film Polar. He plays Dr. Becker in this action noir comics adaptation alongside Mads Mikkelsen, who portrays almost-retired assassin and marked man Duncan Vizla. The movie also stars Vanessa Hudgens, Matt Lucas, Johnny Knoxville and Richard Dreyfuss. Hall worked with a medical prop specialist to play the most believable doctor he could. Hall, who has won awards and acclaim for improv, is encouraged at the current landscape of the entertainment industry. He is beginning to secure roles and auditions that go beyond the comedic genre. Hall hopes to dip his toes further into the action and dramatic realms. “You’re seeing casting basing decisions on talent than if a person fits the physicality they are looking for,” he said. “It’s nicer to see what people in casting are looking at…They are seeing diversity and that there are so many kinds of diversity. And physical diversity is certainly one of them. Rather than someone being small and therefore being a punchline, it’s no, this person is a solid actor and we want them in our production. “I like to think society in general is evolving and is a lot more aware and reflective of what real life looks like and sounds like. I like to think that trend will continue.